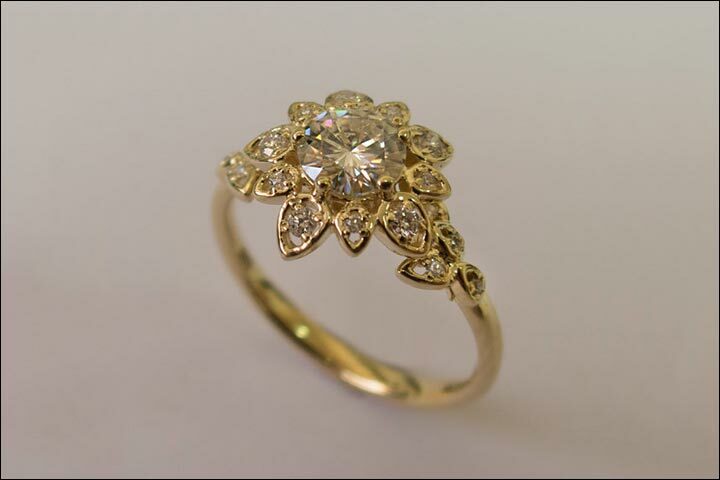 Looking for yellow gold engagement rings? You’re at the right place. White gold and platinum have been done to death. Yellow gold is trending. It sparkles on its own. And it fares far better than white for Indian skin tones. I’m not being skin tone insensitive. C’mon! Yellow gold engagement rings just look better on us. 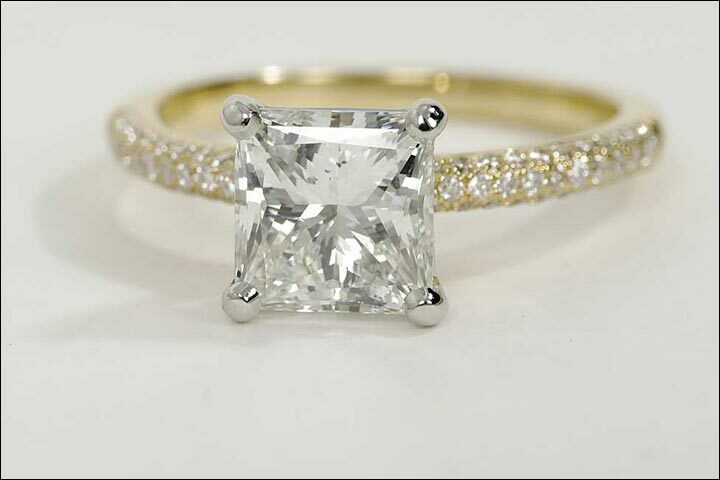 When teamed with diamonds, it brings out the best in the metal, the yellow against the white sparkle of the stone. 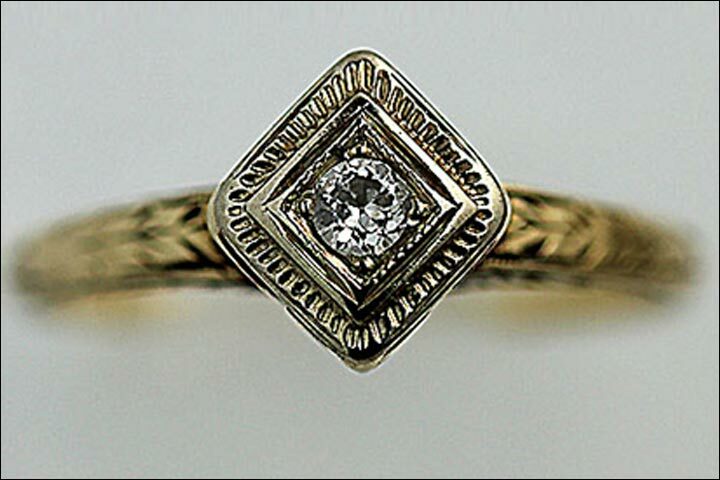 Vintage rings especially look better in yellow gold. As always, let’s start with the diamonds. The diamonds are differentiated by cut, clarity and shape. 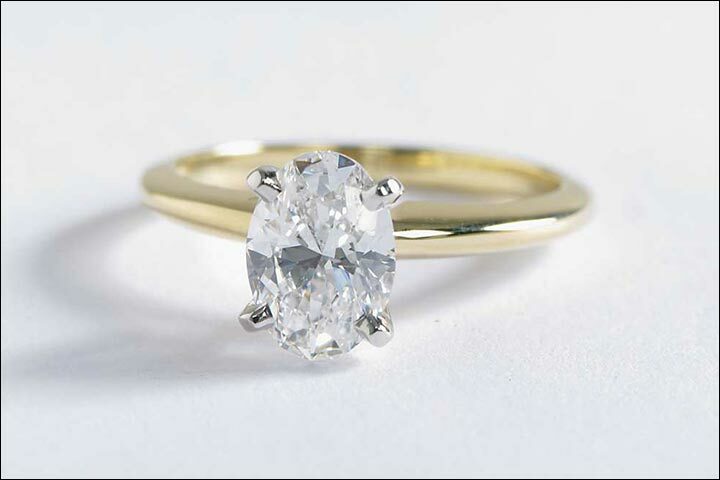 The classic round diamond (brilliant cut ) set in yellow gold. There is no way this combination can go wrong. 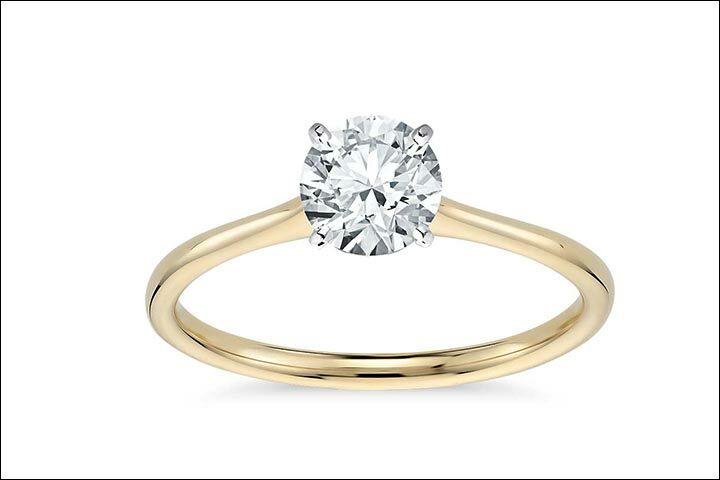 It’s a classic style, and a safe bet for an engagement ring. Price – $690 (approx), will vary with your preferences. This is the second most popular cut in diamonds and most preferred for engagement rings. It’s a square shape. It looks brilliant, especially with diamonds that are 1 carat or above. 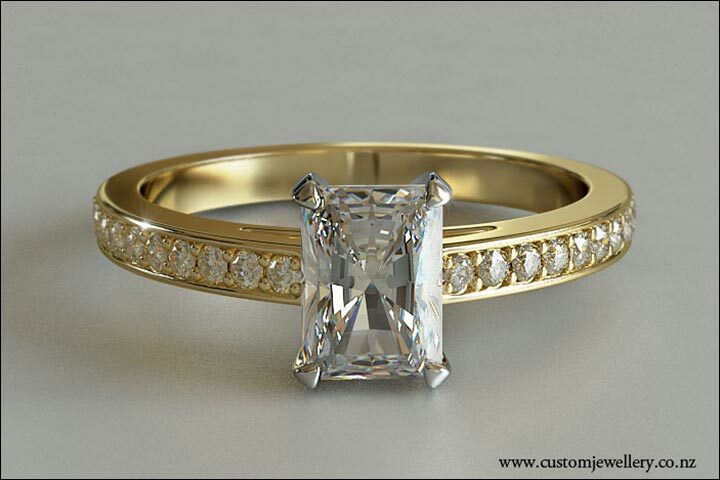 This ring can be customized according to your budget and requirement. 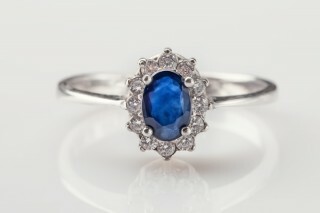 Visit the website bluenile.com and start designing your own ring. Like I said, if you have deep enough pockets, splurge on this cut. It’s worth it. This cut is rectangular in shape. It doesn’t sparkle as much as the round or princess cut. 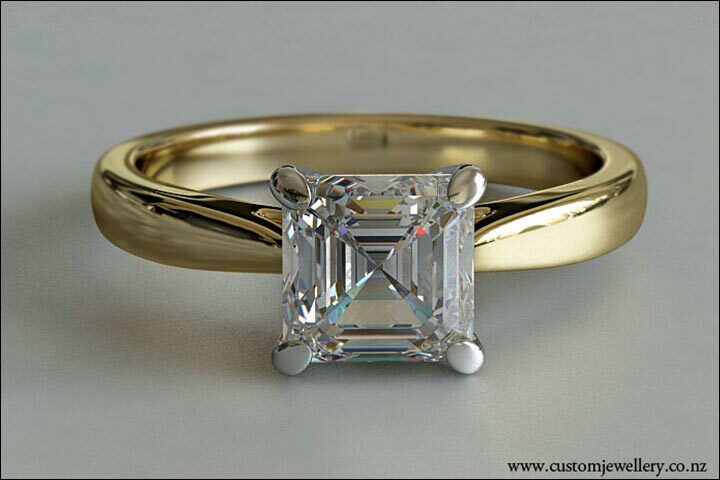 The emerald cut diamond looks best in a ring when teamed with a couple of smaller diamonds on either side. The tiny diamonds you see in the picture are called baguettes, yes, like the bread! To put it simply, it’s a square diamond with rounded corners. There are technical differences and specifications about the way it is cut, stuff we don’t really pay attention to, and frankly don’t even need to. The pear cut diamond is not really a popular choice. But it sure is desirable. 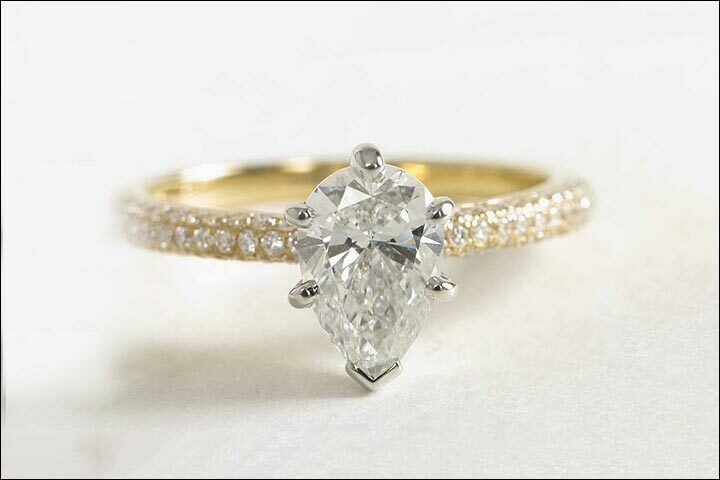 Looks like a tear drop and looks best on a nice band of small diamonds. You could pick either this, or customize the diamond clarity etc, according to your preferences. Heart shape diamond is a very popular choice for engagement rings after the classic round one of course. It’s basically a pear with a cleft. 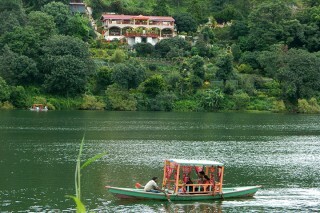 It looks good in any setting. A plain gold band, a band of tiny diamonds, stones on either side. Any style. The oval cut diamonds are basically elongated round diamonds. 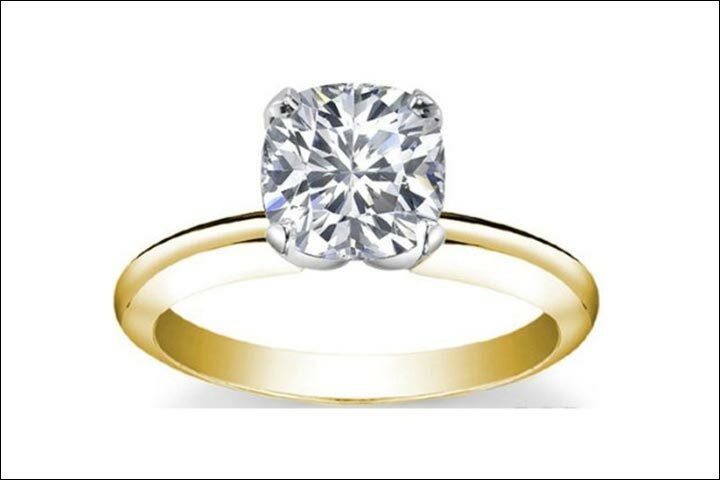 It’s not a popular choice, but is one of the more standard Tiffany engagement ring styles. But just look at the sheer beauty. We are sure it might catch up, with Hollywood celebs sporting this style more frequently now. Price of this ring will vary with the clarity and setting you pick. 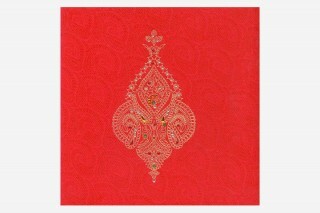 Visit bluenile.com to customize and order. 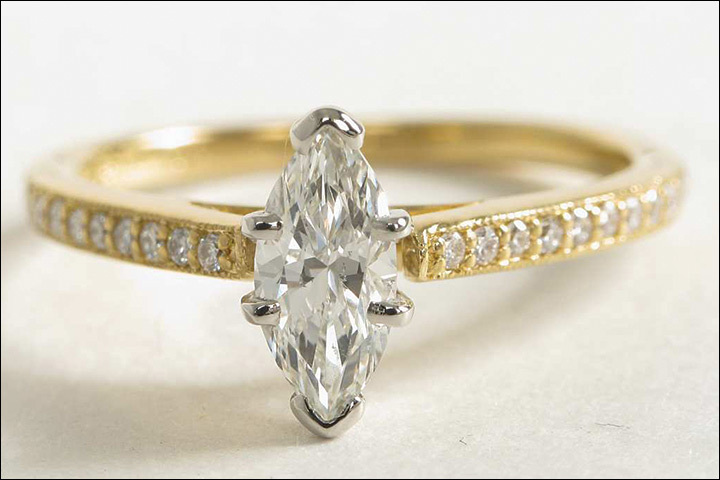 The marquise is just as elongated oval diamond, with pointy tips. This style is a good choice if you have plump fingers, like mine! Available at bluenile.com, for $1384 (approx). 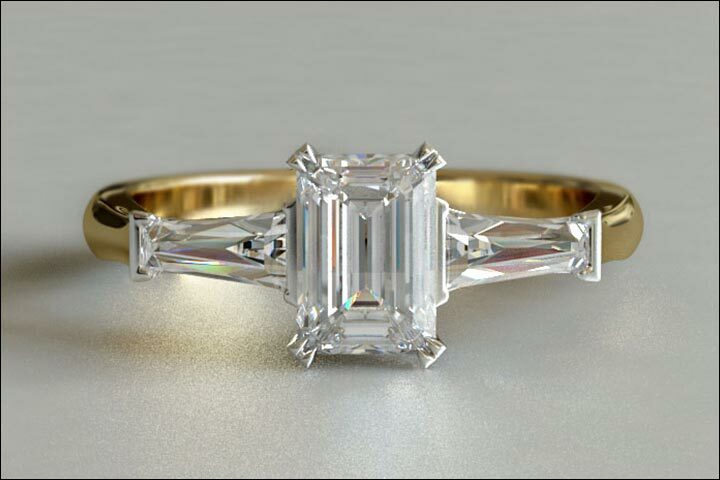 The radiant cut is similar to the princess cut and emerald cut in shape. The difference is that it has trimmed corners. It’s essentially a square emerald cut. Named after the Asscher brothers, this cut is now taken in the same league as the other cuts mentioned above. Ideally, this cut was made for engagement rings for men, but it’s sleek efficient look makes it a kill for both the sexes. So, those were the diamonds options. You could pick other gemstones as well. 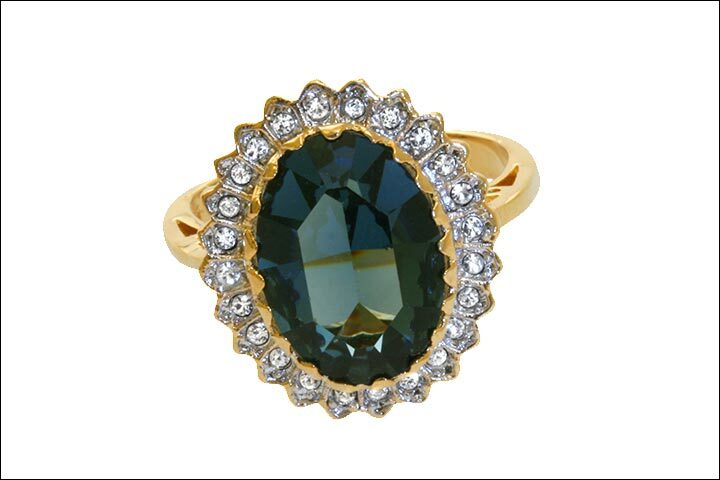 Sapphires, emeralds and rubies look good with yellow gold as well. Steer a little away from conventions, and see if you find the right ring below. 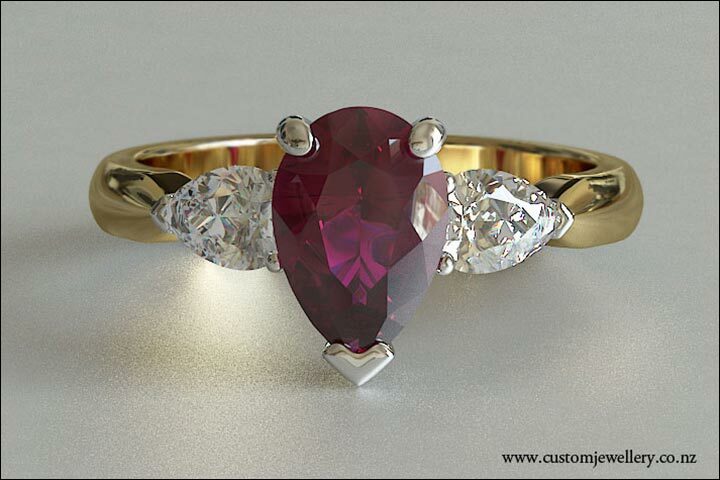 This combination of ruby with diamonds is drool-worthy. The classic three stone setting. All three stones are emeralds. It looks beautiful, doesn’t it? 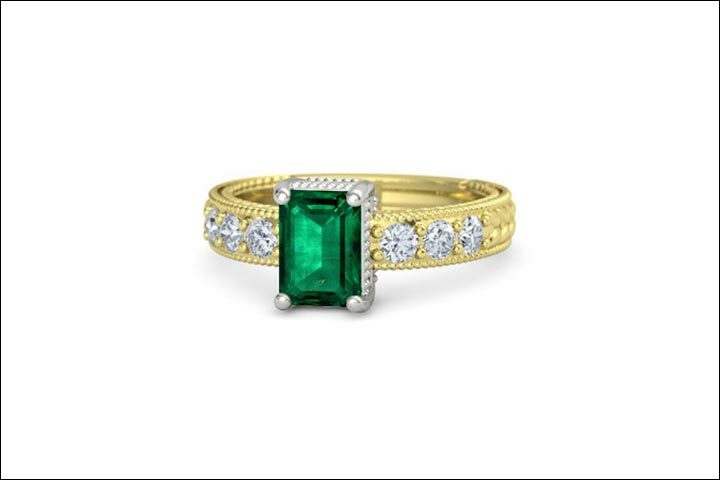 You could add diamonds in place of the smaller emeralds, or simply keep the setting on a delicate diamond band. The sapphire engagement ring became a popular choice after Princess Diana wore one. Now Princess Kate wears the same vintage ring. You could replicate that style or look at the option below. It’s no less stunning. If you want to steer further and want to make the ring unique then try a vintage style ring. Or you could even opt for an actual vintage ring, if the pockets permit. The details on this ring and stone itself are so pretty. You just can’t give this one a miss. A combination of diamonds, set in flower petal design. Looks sweet. So there you go. 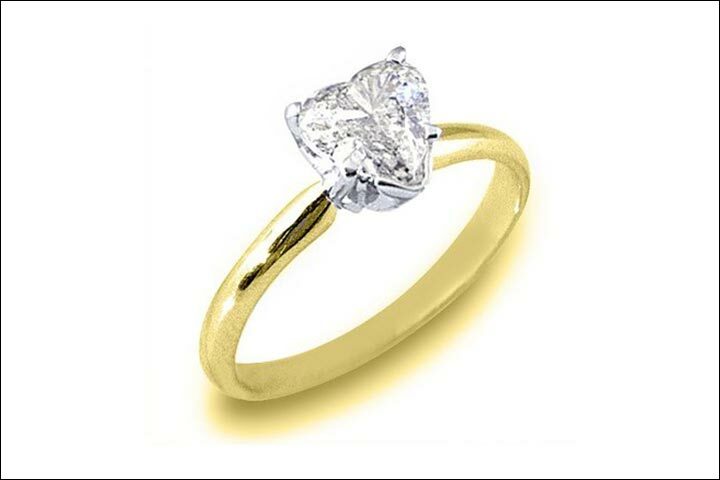 Like our selection of yellow gold engagement rings? 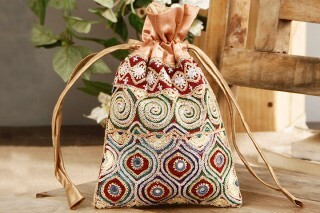 You could even draw inspiration from the designs and get one custom-made too. Share your thoughts.